A dialog works as follows: the first mask to speak first turns to the mask he speaks to, in order to show him and the audience who he is talking to. The he turns his mask to the audience and acts and says what he has to say. The other mask looks at the mask that speaks so the audience understands that he is listening. When the fist mask is ready he turns back to the second mask to give him the focus. The second mask turns out to the audience to answer or react to what is said. 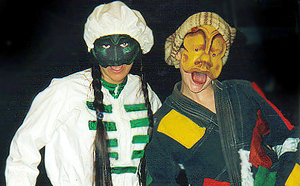 This “takes” (the turn of the head out to the audience) or “body takes” (a bigger turn using the whole body) are the mask’s windows to the audience. It is here the audience can follow the inner life of the mask. It uses the takes when it speaks, reacts, change state of emotions even when it speaks direct to the audience. In this way the mask technique reminds of puppet theatre or the way cartoons are drawn. But the masks are not puppets or cartons. They are flesh and blood. It is therefore extremely important that the actor behind the mask really sees and communicates with the audience he or she is reacting to. If the actor is too fast to see or chooses not to see the audience, the audience will not see the mask and its intentions. The content of the show and the mask’s/actor’s loses its value and he becomes as dead as the puppet in puppet theatre. Both the mask and the puppet are just pieces of dead matter until and actor fills it with life. Commedia dell’Arte is a kind of theatre with no idea about a 4:th wall and it is constantly in contact with its audience. The most important focus for the actor is always the audience. 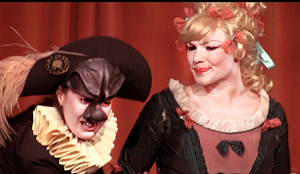 If the mask loses the contact with the audience it dies or playing something else than Commedia dell’Arte. Obviously the actors have to be in contact with its colleagues on stage, but that contact is secondary to the contact with the audience. Every mask uses all the time the other masks as their sounding board in its dialog with the audience. This entry was posted in Acting style and tagged blog, blogg, bodytakes, comedy, commedia, Commedia dell arte, fixed masks, Klingvall, Kompani Komedi, Kulturama, mask technique, masks, Micke Klingvall, physical theatre, sidelines, take, takes, theatre education, theatre teacher, Theatrestudio, vulgar, vulgar comedy, Zanni. Bookmark the permalink.